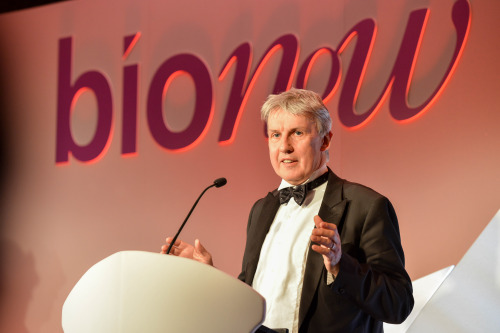 The outstanding contribution made to life sciences by entrepreneur Dr Stephen Little, Chief Executive of AIM-listed molecular diagnostics company Premaitha Health, was recognised last night at the 16th annual Bionow Awards. Dr Little, who led Manchester-based Premaitha through its successful AIM listing in July 2014, has an impressive track record of building biotech businesses and creating value. He is the former CEO of DxS, an innovator in the field of personalised medicine, developing and manufacturing companion diagnostics. DxS was funded with £3.5m in 2001 and was sold to QIAGEN in 2009 for £85m. Before DxS, Dr Little worked for 20 years in various senior positions in the diagnostic divisions of AstraZeneca and ICI. He holds a PhD from Heriot-Watt University in Edinburgh. Celebrating the outstanding leaders and innovators in the life sciences sector in the North of England, the Bionow awards ceremony was attended by more than 400 people at the Mere Golf Resort and Spa in Cheshire. In the highly sought-after Company of the Year category, Keele Science Park-based Cobra Biologics was triumphant. Cobra, an international contract development and manufacturer of biologics and pharmaceuticals, is in the midst of a £15m expansion programme in the UK and Sweden. The company, which manufactures DNA and viral vectors for the gene therapy market, exports 98% of its products. A £700,000 fundraising by University of Manchester spin-out company Microbiosensor, which develops disposable point-of-care medical devices, was named Investment Deal of the Year, while Peter Chater a research associate at the University of Newcastle won in the prestigious Promising Technologist of the Year category. The awards, which recognise excellence, outstanding achievement and enterprise in a sector that is worth £11bn to the North’s economy, were sponsored by Manchester Science Partnerships, Appleyard Lees and World Courier. Reducing the time to surgery for ankle fracture patients. Dr Geoff Davison, chief executive of Bionow, said: “The critical importance of the life sciences sector has been acknowledged in the Government’s new Industrial Strategy this week. It is hugely pleasing to see new financial support and a clear focus on supporting R&D-focused businesses and encouraging collaboration with the NHS as part of this. Dr Davison added: “As ever we had an incredibly strong shortlist all are to be commended for their innovation in providing solutions which have the potential to be game-changing in the industry. A not-for-profit membership organisation, Bionow supports the North of England’s burgeoning life sciences sector, which currently includes some 1,000 science and healthcare companies with a combined turnover of around £10.9bn. Its member base includes start-ups and spin-outs as well as well-established businesses. The services it offers to firms include dedicated business support programmes, shared procurement schemes and recruitment and training support.